Real estate agents come in all different shapes and sizes. Some are selling hundreds of homes every year while others are happy selling real estate only to close family and friends. Negotiating styles may be different and marketing efforts will vary, but one thing all real estate agents have in common is that they use more of their brain than their counterparts in other industries. Join me for a quick anatomy lesson. The human brain is made up of 3 different parts, the forebrain, midbrain and hindbrain. The midbrain and the hindbrain handle the functions that keep you alive and functioning so we can agree that all living people use these functions equally (though we could debate whether watching Judge Judy every day on your couch is considered functioning). But the third component – the forebrain – is the thick, veiny top portion of the brain that controls your thoughts, feelings and analytical abilities. This is the portion of the brain that agents utilize to a much greater degree than other professionals. The typical American Business has 16.1 employees, each of whom is dedicated to a specific facet of the company’s operations. There is generally a sales department, accounting department, HR, marketing group, etc. The typical employee is not asked to work in each department but instead employed to work within a single department every day. This repetitive behavior causes employees to use only the portion of their brain consistent with that skill set, while the rest of the brain remains in sleep mode. The responsibilities of a real estate agent are the complete opposite. As business owners, agents must accomplish with their single brain what is commonly divided between the 16 employees of a typical company. 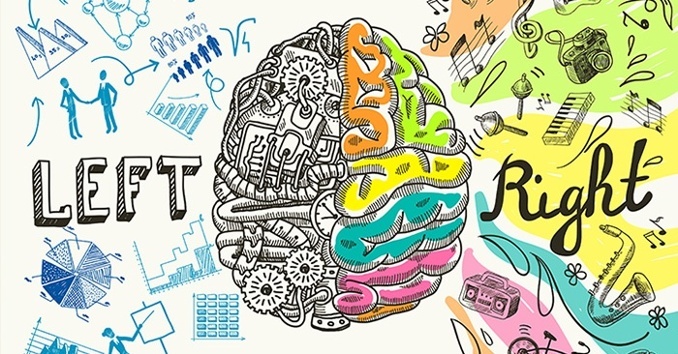 Whereas most Americans relate to being more creative (right-brain) or more analytical (left-brain) and seek out a job that plays to their strengths, real estate agents have to be the “both-brain” type. Here is a quick breakdown of how we flex our both-brain muscles. Recognizing faces – Nothing ruins a potential future referral faster than failing to recognize one of your past clients. There’s nothing worse than that awkward conversation at the grocery store! Interpreting Color – Color correlates with staging. Agents are on the forefront of what the majority of buyers want in a home, all the way down to the colors on the wall. I’ve come across neon bedrooms, black family rooms and a modern home where everything (seriously everything) was white. Color sells homes and it’s the agent’s job to help you choose a color palette for the masses. Creating Images – Nothing sells a home faster than awesome photos. Seeing as how most agents take their own pictures, we must determine the best way to capture the look and feel of a home to market online. Possessing Intuition – Whether it’s intuition into who we employ on our team, which buyers “aren’t” liars, or setting the right expectations for our sellers in a slow market, an agent’s intuition is what will define their path to success. Unlimited Creativity – If you watch HGTV, you see how creative agents have to be both in their personal marketing and their property marketing. I send out a regular newsletter called “My Two Cents-innati,” what’s a more creative name than that?!? Sound Logic – If we don’t close a property, we don’t make any money for our time and effort. We are constantly making logical decisions for our business like when to stop working with the buyer who has seen 120 homes or when to finally cancel our Top Producer account. Critical thinking – One aspect of our job is to predict the value of a totally unique house at some point in the future. We also need to decide if syndicating leads to Zillow is a good thing. If these issues doesn’t require critical thinking, I don’t know what does! Numbers – Whether it’s a home valuation, managing our business income & expenses or achieving sales goals, numbers are the driving force behind whether an agent thrives or dies in this business. Detail Oriented – Finding the house is the easy part, managing the 100+ details that go into coordinating the deal from contract to closing is a job in itself. If an agent lacks organization, it will come back to burn everyone. So believe me when I tell you that our job doesn’t stop at the execution of the contract. Systems based – The only way to grow is to systematize your business so that marketing is consistent and each client receives the same, high quality service you intend to provide. After all, that personalized door knocker isn’t going to order itself 10 days before closing! Real estate agents don’t have the luxury of honing a particular skill set since we’re tasked with so many different responsibilities. While I’m not arguing that real estate agents are the most intelligent people in this world (I’m not even the smartest person in my own house), I do feel that our profession requires that we use more of our brain than the typical employee. And that notion, in itself, is awesome.